The Ausbon Sargent Land Preservation Trust preserves the rural landscape of the Mt. Kearsarge/Lake Sunapee region in central New Hampshire through conservation easements and land acquisitions. These deeded restrictions protect land, limit future development and offer tax benefits to land donors. In addition to protecting the farms, forests, streams and wetlands of the region now and forever, the trust’s mission includes educating local communities about land preservation. In 2004, Ausbon Sargent set a difficult goal of protecting up to 25% of the land in the region by 2025, increasing preserved land from 3,420 to 24, 545 acres. This goal aligns with guidelines set by the Society for the Protection of NH Forests in the NH Everlasting Initiative. To meet this challenge they knew they needed a larger staff, increased contributions and a larger membership base. The organization operates within the twelve-town Mt. Kearsarge/Lake Sunapee region of central NH. Donors are highly concentrated in New London, where their offices are located. An additional goal was to increase donor penetration from other local towns. Market study (2004) to understand the core market (potential donors), the competition for donations, and population growth trends in the region. Updated market study (2009) to analyze improvements and changes. ESC’s market study analyzed census data, population and growth projections, patterns of charitable giving in NH, a member survey and comparative data on membership contributions from other land trusts. This data was used to understand the organization’s growth capacity and as input to the strategic planning exercise facilitated by ESC. Protect 800 acres per year in 2006-08 and 1300 acres in 2009-10. Increase membership and contributions from major donors. Increase outreach to the twelve communities. Hire additional staff including a land protection specialist. and to analyze improvements and changes that have occurred. The number of donors has increased by 19%. more of New Hampshire’s scenic beauty for future generations. awareness of Ausbon Sargent in the twelve-town region. Ausbon Sargent Land Preservation Trust has aided in the preservation of 6,287 acres in 102 properties for future generations since their founding in 1987. 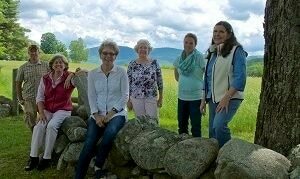 With increased contributions and two full-time land protection specialists, they are well on their way to the goal of protecting 25% of the land in the central NH region by 2025.